Maruti Alto is the highest selling car in the country. The Maruti Alto 800 is the entry-level engine to the Alto brand. This was formed as Maruti Suzuki discontinued 800 and got the Alto. It didn’t want to let the 800 badge go. So it retained the badge on this new car. To retain both the names. Well it was launched in 2012 and since then there has been no looking back. The company has revised this new hatchback to make it look appealing and stylish. There have been some addition of features too. Read further as we tell you more about the Maruti Alto 800 Price, Specifications and features. Book a test drive for Alto 800 in Hyderabad at Tryaldrive. The front is where you find the most dominant changes to the design. Instead of the thin chrome grille with a body coloured slat, you now get a chunky piece of plastic that flows neatly between the headlamps and an inverted airdam below it courtesy the new bumper. The car also looks wider due to the update up front. There are other minute changes for which one would have to look really close. For example, the headlamps now have an amber-coloured housing for the turn indicators and you also get fog lamps that were not present in the previous version. But, this it is not standard and is only available on the top of the line variant. What you now do get as standard is the left side ORVM. Move to the side and what you see is exactly the same straight shoulder line with no drama, which is a good thing if you are looking at a simple, no-nonsense design in a car. The rear has the same tail lamp housing as the outgoing version with the similar bulge curving near the centre on each side of the Suzuki logo. The bumper between both versions is the same and gets space for the registration number plate in an inverted U-shape cutout of the bumper. Overall, the exterior has some tweaks but, they are not big enough to notice. You would have to be a fanatic and look really close to notice the changes. On the whole, it is still a simple, no-nonsense design. This is another department that scores a huge plus from our side. The ride is pretty planted and there is minimal body roll while negotiating tight corners as compared to the competition. There is a bit of understeer but nothing to complain about. The Alto 800 keeps its composure, unlike its competition in the segment. What you also notice is the way this little hatch tackles bad roads. Passengers or the driver have very little jerks felt inside the cabin. Sure, on really poor stretches the car will undulate a lot, but it being a monocoque chassis like all its rivals, there is nothing much you can do about. That said, the pliant ride and good handling characteristics like its predecessor are very good and keep the Alto 800 well-planted over all roads. Maruti Suzuki Alto 800 On-Road Price in Chennai ranges from 2,95,968 to 4,38,434 for variants Alto 800 Standard and Alto 800 LXI CNG Optional respectively. Maruti Suzuki Alto 800 is available in 10 variants and 6 colours. 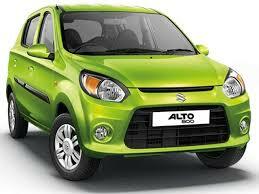 Below are details of Maruti Suzuki Alto 800 variants price in Chennai. Check for Alto 800 price in Chennai at Carzprice. Maruti Alto 800 is one of the best car options offered to common man in the overcrowded Indian automotive market. No doubt there are a few drawbacks in the design, looks and interior comforts, where Maruti stands behind its competitors; however, the brand trust and the after-sale service that Maruti offers make it one of the most reliable options that are present in the market currently. Apart from these points, a deadly combination of pocket-friendly price and class-leading mileage figure is one point that helps this car win over all the others. An ARAI rating of 22.74 kmpl bestows Alto 800 with an unmatched range of 796 kms, which again makes it one of the best cars available in the ‘A’ car segment. The CNG kit offered with the car blesses it with a class-leading fuel efficiency of 30 kmpl. The inclusion of an airbag is a welcome option in this range, which is available as an optional feature for just Rs.16, 000. Unlike previous models, Maruti Suzuki has also updated the colour profile and is offering the small car in six vibrant colors: blue, grey, frost blue, silver, red and white. Alto 800 is the rightful heir of the two legendary cars that were the brightest gems of Maruti’s crown. Despite being a few steps back from its contemporaries, Alto 800 is a pretty good option that economically serves all the basic purposes of travel and commutation.